We are an independent company located in Bedford, Bedfordshire. We provide highly trained and qualified care staff to offer high quality care solutions in a dignified manner. We use a range of helpful and friendly yet effective care techniques for adults who need help and support within their own homes. All the care packages are specially tailored to Clients’ needs with the aim of enhancing and promoting independence. Our team are there to help you to live as independently as possible. They will arrange to meet with you to agree your support plan, which will identify any areas of support that you may need to help you to live independently. This may change from time to time (for example, your needs may be higher after a hospital stay) so the support is flexible to suit your needs. You will be provided with a copy of your support plan, which will be reviewed every six months or sooner if your needs change, or you request an earlier review. We will always visit you to welcome you to the support service, explaining what we do, our professional boundaries and how we will encourage your independence, both by your actions and by enlisting help from other agencies. 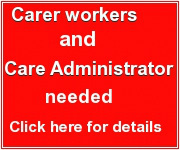 Want to be a carer? ©2011 FirstCareGB LTD. All rights reserved.